This home is the last home on a peninsula with unobstructed waterfront views from all 3 sides it overlooks hundreds of acres of the best nature has to offer, back country bay or gulf of Mexico fishing,boating, canoeing & kayaking view dolphins, manatees from dock & rear balconies or bird watch from the front balconies miles of stunning waterfront views & sunsets private only 8 waterfront homes in our area ... Retreat...Relax...Refresh.... Renew. Home features: Features are:Waterfront Tiki Hut & cable T V with bamboo bar. Bamboo moon chairs with double pillow hammock. Come and enjoy yourself ! Centrally located in Tampa, 5 mins. from the airport,.Arrangements for shuttle can be made. Welcome to The New Waterfront Million Dollar View! This home has 27ft vaulted ceiling in the living room with 60' Plasma Flat Screen TV. Every room has plasma flat screens, and DVD players with a great selection of movies & great novels. 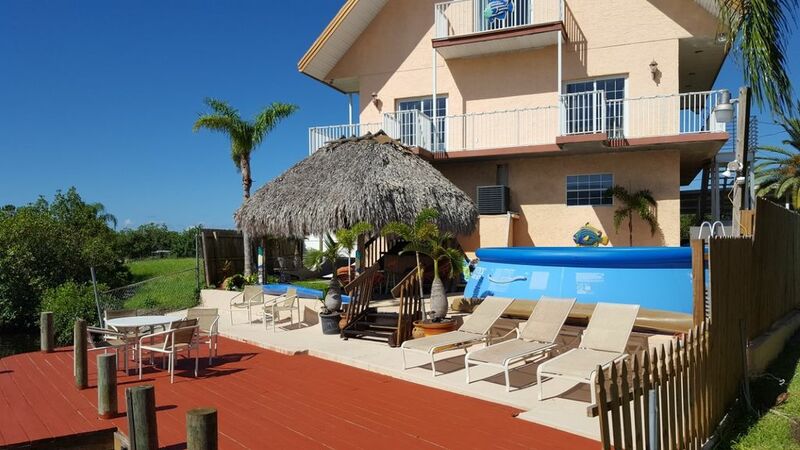 Last house on the waterway with a wraparound balcony has unobstructed sunsets and sunrises located on a bird sanctuary.Enjoy the double pillow hammock in the Waterfront Tiki or a cocktail at the bamboo bar. Canoe and Kayaks are free to use at your leisure.Paddles & life jackets it's all here.... Want to go Dolphin and Manatee watching? HA! You don't have to go far! Just step outside on the dock to see a multitude of wildlife. Fish for snook, redfish, trout, sheaphead, amber-jack, and mullet or go out for the big game in Tampa Bay, grouper, snapper, Spanish. mackerel, tarpon or into the Gulf of Mexico. Features are:Waterfront Tiki Hut & cable T V with bamboo bar. Bamboo moon chairs with double pillow hammock. Come and enjoy! The house is nice and close to everything as many others have stated. The owner and family were nice. The views were amazing from the inside. The only major issue is at the time of year we went the bugs were biting very seriously. The owner did have skin repellent available but unfortunately when found out it was too late most of the bites occurred. We are not smokers so the linens did smell of smoke but not the house itself and were able to work around that. Larry and Deborah's place truly has million dollar views! From the moment we woke up until the sunset, it was fantastic watching the birds, dolphins, and manatees. In addition, the place has plenty of room for 6+ people. The tiki bar, hammock, and lounge chairs were a great place to hang in the evening. Using the kayaks to paddle through the mangroves with dolphin was a great experience! In addition, Larry was a great guide as he took some of our boys out fishing one day. This place was so easy to get around Tampa, Clearwater, and the other beaches. We had a blast and look forward to next Spring! Our family of 6 arrived at the villa straight from the airport with no wrong turns, directions to the property were perfect! Upon arrival in a massive lightening storm, Larry braved the rain to great us and welcome us in. The villa was very spacious, clean and was outfitted with all you could need. The main floor with the open plan living, dining and kitchen had fantastic views of the beautiful mangroves and the first night we even saw a distant fireworks show. The master bedroom suite upstairs also had expansive views. Our kids loved to go kayaking and with Larry's guidance helped them set a crab trap. Debbie was on hand to help us with anything we needed and gave us tips of places to go. The location of the villa is absolutely perfect, from supermarkets, malls, restaurants and various attractions you never seemed to be too far from anything. I would highly recommend this property to anyone and we look forward to coming back again. Thank you Larry and Debbie for a wonderful vacation and we truly appreciate all you did for us. Your friends from Barbados. Love the location, love the pool, love the view! Great place to stay in Tampa with great owners. We just spent 7 days here for spring break with a family of 5+. The setting is wonderful, nestled quietly on a dead end street nestled in the mangroves. The house was awesome, with lots of space. My wife and I brought our 16 year old, his friend and our 6 and 7 year olds. The young kids loved playing out back under the tiki bar and running laps around the wrap around deck. The 16 year olds took frequent kayak rides out into the mangroves and had a blast. We had rainy weather but still found plenty to do at the house and around town - as the property has a good central location. Easy to get downtown or to the numerous beaches. House was clean and well equipped to cook numerous meals. I nice grocery store is literally 2 minutes away. Can't say enough about Larry and Deborah's hospitality. They greeted us warmly and spent time showing us around the property. They were around when needed and even surprised us with great BBQ chicken legs one night. Very good people. He had just replaced the grill only because the previous one was a little hard to use which addresses the concern of a previous guest. Very spacious house with great amenities. I went with my wife and 2 daughters. Everyone had their own space but we could gather in the living room to watch the big screen tv. Larry was very gracious and helpful without being overbearing. The house was off the beaten path but close to everything. It took us 20 to 30 minutes to get to Busch Gardens.On our last day Larry took us out on his boat for sunset cruise. All in all this was a great find for us and we enjoyed every minute. We would definitely stay again. The Waterfront Million Dollar View Great Back Country Fishing, Kayaking, Canoeing, Busch Gardens, The Hard Rock Casino.